Memory Lane Friday is a weekly chance to blog about your memories, to preserve them for your families. The more the merrier, so join in! This week's theme is 'Those Ugly Clothes I Wore'. And once I started going through old photo albums, I realized I should've done a series because there are so many to choose from. So don't worry if you can't get them all in one post. It's a topic that will be revisited in the future for sure. Let me start with this. 1977. I think. Although my stylin' shirt says "Spirit of '76" all over it. Then I've got my denim apple worm bibs on. But of course, the best piece is the Miller Beer hat. Come on folks, if you're going to dress you toddler in beer gear, at least pick a decent beer?!? Do they make 2T Corona hats these days? 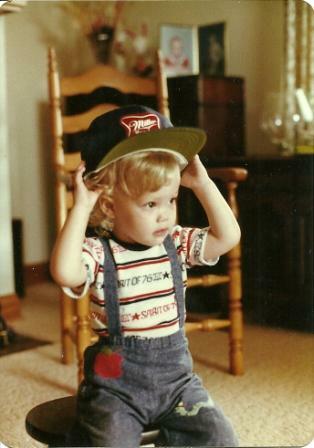 Okay, fast forward to early, early 80s. Here, I am sporting my purple high rise pants and stripey belly shirt. 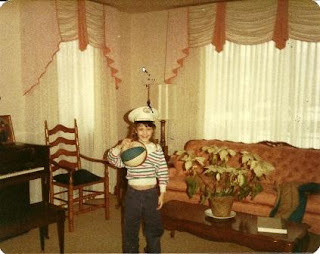 Another trendy hat option in this pic...The Captain's Hat. Actually, the hat was at my grandparents' house. Next we have the oh-so-popular early 80s terry cloth one piece. What were these called anyhow? Ugly, yet somehow, they kept you nice and cool. Just think about it...you're out in the sun and you start sweating...no need for a towel. Just use your terry cloth one piece to mop your brow! Also early 80s we have the pink unicorn rainbow shirt (you know my friends were jealous! ), more high rise jeans (because no proper girl has just one pair) and the black sombrero. 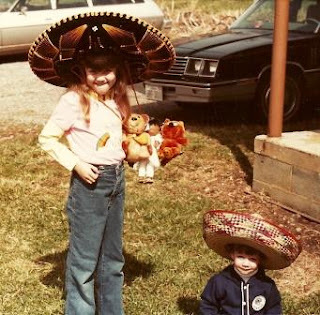 My brother Taylor has a great sombrero too. Souvenirs from my parents' trip to Mexico. If you're going to wear your bright flashy sweatshirt, best pair it with a puffy white jacket (with faux fur hood) and some matching tall white poofy boots. I think that's because I was doing some practice dance moves. A La Rock Me Amadeus. Oh dear. Oh dear, dear me. 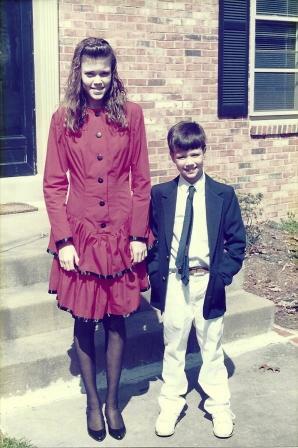 May I never wear a dress like this again. That's all I have to say about that unfortunate piece of clothing. And to think, I picked this pattern out myself. After you blog, just grab the code below the button and copy + paste it into your blog. If you have time, check out the blogs of others. Next week the theme is "Those Foods You Loved". Did you have a food you lived on as a kid? Do you miss your grandmother's sheet cake? This'll be the time to talk about it. Also, if you have a topic you'd like to see for Memory Lane Friday, let me know! OMG, I totally had one of those terry cloth one pieces too! LMAO! These are great! These pics are amazing! I don't think I have any of my old pics here with me, but if I do I'll try to check and take pics of them w/ a digital camera, or scan 'em or something!!! LOVE it! 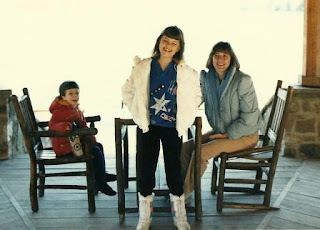 I think no kids' wardrobe from the '70s/'80s was complete without the terrycloth outfit! I almost used a photo of myself in one of those "fabulous" outfits in my post today! 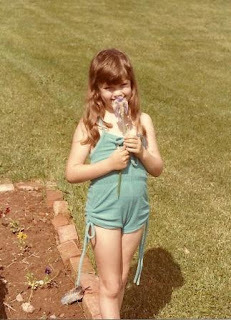 I too had a terry cloth one piece back in the 80s! It must have been mandatory! The little worm pants were made by your Aunt Carolyn. The hat was your Uncle Chris' Fork Union Military Academy uniform hat. I can't believe I was willing to make you such an ugly Easter dress.